A common treatment provided by rural health-care providers is wound care. Whether it is a fresh acute wound or a chronic longstanding wound, the basic treatment is the same, only your initial approach to the wound changes. 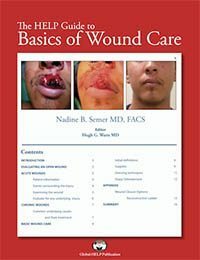 This HELP publication will present the basic information for evaluating both acute and chronic wounds and then providing the appropriate care. This publication does not cover life-threatening injuries. Arabic translation by Alaa Azmi Ahmad, Haytham Musmar, & Yousef Arafat. Indonesian translation by Dr. Th. E. Sudrajat Wahyu Nugroho. Persian translation by Mohammad Pipelzadeh. Russian translation by Nataliia Moskalenko.